I am just going to start this post with the word blasphemy because it's fun to say, and it means exactly what I'll be talking about. Act 2: Pastor shows clip of movie about The Resurrection wherein Mary Magdalene rushes to the tomb to find it empty then rushes to alert Peter & John who run back to see for themselves before running off to tell the other disciples while Mary cries. Then Mary sees the angels and hears a voice, presumably from "a gardener" tending a plant across the way. She responds and moves toward him but, as the story goes, cannot yet identify him as he speaks. Finally they are next to each other and Jesus reveals himself by showing his scarred hands and removing his hood. Act 3: I silently freak out upon realizing Jesus is Desmond from LOST. Act 4: No real idea as for the remainder of the service my brain was stuck on how hot Jesus was. Yep, you're going to Hell. At least it'll be steamy down there, right? you've single-handedly divulged the key to that most twisted show "Lost"
and that island is no island but in fact it is the west bank! omg thanks be to Desmond I won't be the only one there! It's nice to see a good Christian rock the blasphemy. You did very well. I don't know that I could have behaved properly; I might have eye contact with someone and the giggling would begin. We dont get movies in our services; just pew aerobics: Stand, sit, sing, stand, sing, sit, stand, sing, kneel, stand, shake hands, sing, kneel, walk up aisle, kneel, sit, stand, exit. How do you like that choreography?! Wow. That is too funny! And it is the first I realized that you and Stu are such religious rebels. You have officially inspired me. Your blasphemy is so tame compared to the goings-on in my Trailer for Tuesday post. Which I am now writing. Little did the preacher know what effect he was having on his flock. Ooh I hate when that happens! OMG. I would not have been able to sit on that one. I would have been whispering to everyone around me, IS THAT DESMOND? IS THAT DESMOND? And being a general spaz. So good job. If they work this into the Lost plot line, that would be awesome. 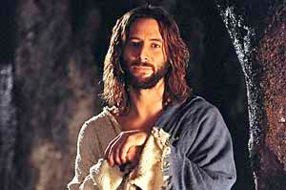 I'd go to church more often if they were showing movies with Desmond as Jesus! Of course lightening would probably strike me dead for my sinful thoughts, so maybe I better just stay home. LOL! Oh, sure, Miss Healthypants. But did you comment on my post, let alone LOL? I think not. Humph. Everyone loves Bad Mom more than me. Yeah, like at the same time I was complaining - AFTER you visited Bad Mom. And a grin, while nice, is not a LOL. I just don't have what it takes. And I blaspheme a lot more than Bad Mom ever will!! ok...my biggest childhood crush?? The actor who played Jesus in Jesus of Nazareth. I have not been able to bring myself to Google him. But he was AMAZING!! Oh, and Olivia Hussey played Mary, so there was something for the menfolk, too...or the ladies who like ladies. Wow, now who's going to HELL???? I also think it's really funny, ha ha, that your pastor showed a video clip on Easter Sunday to tell the Resurrection story. Whatever happened to skits? Or dramatic readings?? Or hallelujah choirs? ROTFLMAO.....too funny. But ya know, you ARE gonna burn for that, right? Hey - I bet even Jesus likes a compliment once in a while. Yeah, you're in trouble. And I'm in trouble for laughing.